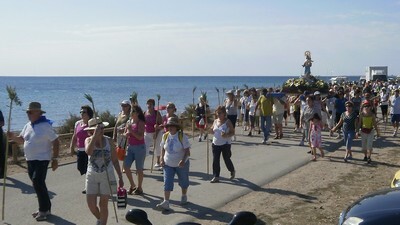 Romeria Del Cap is a pilgrimage, in honour to our Rosary Lady, going from Santa Pola Assumption church to the hermitage placed close to Santa Pola’s Cape. It’s name, “Romeria del Cap”, comes from the valencian language and makes reference to the place where it is celebrated, Santa Pola’s Cape or originally “Cap de l’aljub”. The pilgrimage has celebrated since early years in 20th century, the sunday closest to Saint John’s day, the 24th june. It is an opportunity to worthship the Virgin and to enjoy a magnific family day in an incomparable environment, though the hermitage is close to the beach and also close to the mountains.